Cloud storage service Box released an update for its Android app that it says will help accelerate the way people get work done on their mobile device. Included in today’s change log for its app are new updates feed and home screen widget, the ability to manage your offline files in real-time, multiple account support, and more. With this new updates feed, users will find a document previews area that will display what file has been updated without you needing to click on every single one. Akin to what one might find with the Facebook News Feed, Box’s updates feed will display recent activity or updates from the people you work with — no longer will you need to second guess what file is the most recent or even search for it. One of the advantages of having an Android device is the ability to insert a widget right on the device that functions like a portal or bookmark into a particular service. In Box’s case, it has made it so a widget can be added to the device, saving users at least a step when they want to access their files. 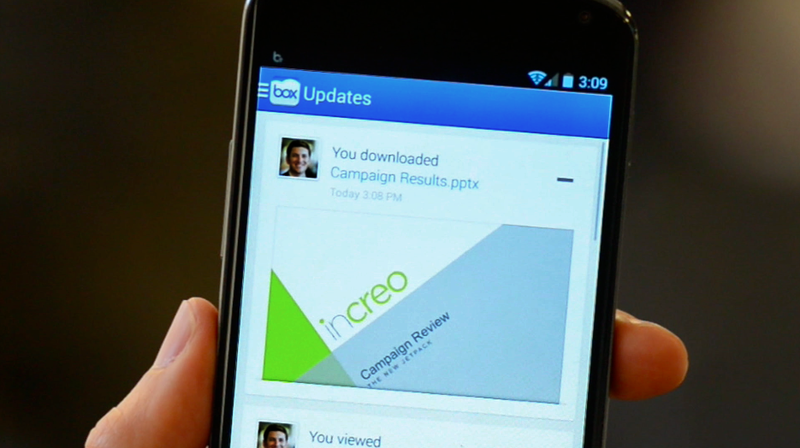 Recognizing that devices won’t be online 100 percent of the time, Box for Android now offers real-time notifications that will tell you when files have been updated while you were offline. In doing so, the company is hoping that it will prevent its customers from using outdated files when they could simply pull it from the Web. With the latest release, Box for Android does exactly what this offering entails — now you can manage all the files saved on different accounts without needing to log in and out all the time. New navigation drawer: A new navigation menu that can be accessed by swiping from the left. New folder storing and view options: This feature offers up better organizational capabilities, enabling folders to be sorted by file name, date modified, or even file size. There’s also a grid view to allow for a quick scan to know which folder has the right photo or image. Finnish language support: Box for Android now supports the Finnish language, bringing the total number of languages to 23. As the company seeks to further streamline its mobile apps to make it more usable for its users, it has brought on board someone well-versed in the space. It has added David Still, formerly the Director of Product Management – Mobile for Skype, as its new Vice President of Mobile Products. Still has extensive experience in the industry, where he spent time in the trenches at Yahoo! Mobile, Good Technology, and Bubbly.